Automating a lathe: it is possible. This article explains how automation works for different types of turning machines, also known as lathes. 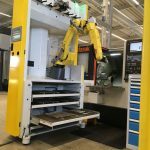 After reading this article you will have a better understanding of what is needed to automate your lathe and at what point it becomes worthwhile to invest in automation. Lathes come in various sizes and specifications and use different fixtures. There is the single spindle, for example, which allows the material to be machined on one side. A double spindle lathe machines the product on both sides in a single turning operation. Commonly used fixtures in lathes are the three-jaw chuck, where the product is held in the three slots of the chuck, or the collet chuck, which fits closely around the tool product and grips it tightly. Lathes are commonly used to make disk-shaped or rod-shaped products, sometimes in combination with simple drilling and milling operations. These types of lathes are used to process disk-shaped products – the so-called inlay work. These are relatively simple pieces with a relatively short throughput time. Products are often made in two steps: first the series of products for the first operation, then the series of products for the second operation. By using a robot, the product can be removed after the first operation, turned around at the turning station and then put back into the machine. This means the product can be fully machined in one operation, assuming that the same chuck can be used. If a different chuck is required for the second operation, the first operation is completed for the series, after which the chucks are changed in the machine and then the second operation is completed with the robot. After chucking, the products are put back through the machine and then automatically removed for the second operation. 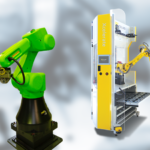 When using a robot for product unloading/loading, a double gripper is often used. This can exchange a processed piece for a new, unprocessed or partially processed piece in one operation. 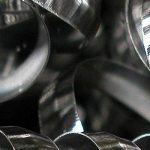 Collet chucks are often used in lathes if a higher clamping force is required than can be achieved with a jaw chuck, and when products may not be damaged. This type of lathe is often used to process rod-shaped products. There are two main types of operation for rod-shaped products: making shorter products from one long rod-shaped product, or machining it on two sides. By automating the process, a product can be removed after the first operation, turned around and then put back into the machine. 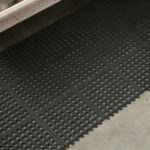 This means that the product can by fully machined in one operation. In this way, a lathe with one spindle can machine a finished product like a machine with two spindles does. To machine longer rod-shaped products, a two-point gripper is used, but a three-point gripper can also be used for shorter products. The robot can also ‘push forward and grab’ the product. In these types of lathes, the second operation is performed in the machine without requiring a second, external operation. 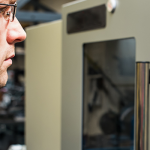 The machine can deliver a fully machined product in one cycle. Both disk-shaped and rod-shaped products are machined in this type of lathe. 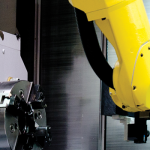 Substantial savings are possible when using a robot equipped with a double gripper. This can exchange a processed piece for a new, unprocessed or partly processed piece in one operation. This method is faster than an operator, as the operator changes pieces in the same way as a single gripper; this means less downtime and more output. With the software used by Cellro, you can opt for turning inside the machine or an external turning station. If there is sufficient space in the machine, turning inside the machine is an option. This saves time, allowing the machine to continue production much faster. Another benefit of using a double gripper is that the fingers on either side of the gripper can be made different so that products that change form, or become smaller, can be grabbed with different fingers than those loading the raw material. What is needed to automate my lathe? To automate your lathe, the following elements are needed and useful to know. The robot cell control must be able to communicate with the machine. A machine connection is required for this. 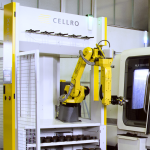 Cellro’s robots can be connected virtually effortlessly to newer CNC machines. Older CNC machines, however, often require some adjustments on the machine side. Nonetheless, almost all lathes can be connected to an automation solution. Stable and manageable processes always benefit the production process: this is a prerequisite for automation. Knowledge of the production process contributes to optimisation and higher efficiency of the machines. What should you consider for a stable and manageable process? Ensure short chip breaking and avoid continuous chips. Rinsing/blow cleaning preferably inside the machine, with a closed door, so that the swarf remains inside. This can be done with coolant or air. Blow cleaning with the robot is also an option. Lathes usually have a limited number of tools available, and 8-16 places is usually the limit. Optimising the use/deployment of tools in the production process offers many benefits if this is well managed. If you want to run many unmanned hours a day, you need to know how the tools can remain within their tolerances and when they must be replaced. Materials that are ideal for longer, unmanned hours are materials that are well-suited to machining, such as aluminium, brass, free-cutting steel, free-cutting stainless steel, etc. Materials that are harder to machine are generally also fine, as long as their behaviour is predictable. However, the unmanned production time is shorter. When should I automate my lathe? Small to medium-sized batch series. A rule of thumb for automating small batch sizes is: if the batch size is big enough to run unmanned for one hour, it is already profitable to use a robot. 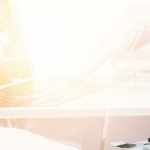 Another benefit of automating repeat products is that you can focus more on the production process, which becomes faster and more stable and means more savings in the next production run. With a lathe, one product cycle is made at a time, because when switching to a new product the fixture and often the tools in the machine have to be adjusted. Human presence is required. Without (small) batch sizes or repeat production, automation is usually not profitable. However, the combination of single pieces or unique parts during the day and batch production at night is a profitable combination: the machine is paid for during daytime production and all extra production hours are profit. Using a robot can increase production capacity in daily output by 20%, based on one machine operator per machine. If one machine operator has to operate two machines, the output increases to 40%. What’s the secret? It’s not so much speed as continuity. A robot can do the same work at the same speed for many hours, is not distracted, has no breaks, phones or meetings and delivers consistent quality. For products with a 2-4-minute cycle, the yield is the highest. Products held in two-jaw or four-jaw chucks often have a somewhat more complex shape. 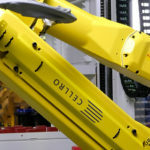 By using the Cellro gripper technology, the robot can handle different positions, square-shaped products and undefined products. The secret is the freedom of configuration of both the fingers and the inlays.